Laboratoire JOLIOT-CURIE - Biophysics and development. Project Leader : Arezki Boudaoud. Accueil du site > Thèmes de recherche > Biophysics and development. Project Leader : Arezki Boudaoud. Our team combines biological, physical and computational approaches to address the development of plants. The development of a multicellular organism relies on both the progressive restriction of cell potentials into specific fates and the changes in the shape of cells and tissues leading to stereotypical morphological phenotypes. While molecular and genetic studies have been highly successful in explaining the cellular basis of development and the role of biochemical gradients in coordinating cell fate, understanding how shape is generated and serves as a template for differentiation remains a central challenge in developmental biology. Indeed, shape is imposed by structural elements, so that an investigation of morphogenesis must address how these elements are controlled at the cell level, and how the mechanical properties of these elements lead to specific growth patterns. In the soft tissues of animals, shape is imposed by the cytoskeleton, adherent junctions, and the extracellular matrix, while in plants, shape is mostly determined by the extracellular matrix (cell walls). Therefore plants appear as perfectly suited for an investigation of the mechanical basis of morphogenesis. We focus our efforts on the Arabidopsis shoot apical meristem (SAM), which contains a population of dividing, undifferentiated stem cells that is maintained for the life of the plant. Founder cells on the flanks of the SAM give rise to flowers, which themselves give rise to organs such as sepals, petals, stamens and carpels. Although extensive genetic analyses have helped identify a highly conserved network of genes involved in patterning the SAM and in the control of floral identity within emerging primordia, the mechanisms that determine the positioning of these organs are not fully understood. The accepted scenario is that phyllotaxis and floral symmetry are regulated by cell-cell signalling (e.g. by peptides, hormones or lipids), with the plant hormone auxin almost certainly being a key player, though direct evidence is extremely limited in the flower. In addition, we have recently showed that mechanical signals are required for certain morphogenetic events, such as boundary formation. Thus organ initiation in the flower might be regulated by a feed-forward mechanism involving signalling as well as physical forces. It is clear that organs are shaped via coordinated growth of the plant. 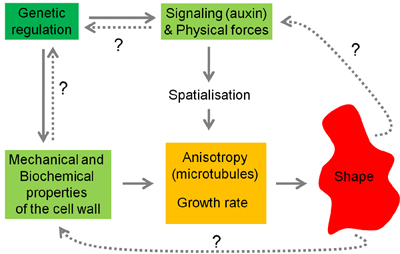 Two parameters – growth rate and growth anisotropy – are sufficient to characterise shape changes. On the one hand, it is believed that plant cell growth is driven by internal turgor pressure (up to 10 bars), and limited by the ability of the cell wall to yield to this pressure. Wall loosening and the associated growth rate are controlled by a large number of cellular processes. On the other hand, growth anisotropy is determined by the direction of the highly oriented cellulose microfibrils that are embedded in the cell wall. This architecture depends mainly on the cytoskeleton : in particular, cortical microtubules (MTs) are thought to guide the movement of cellulose synthase complexes and thus to indirectly control growth anisotropy. Two of our main aims are to quantify growth and understand its genetic regulation. More generally, our work will help clarify the links between cellular behaviour and macroscopic morphological phenotypes.